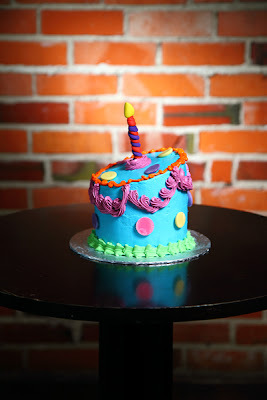 If you missed the Fall Issue of Urban Infant, we got featured on how to make your own Whimsical Smash Cake. Ken photographed me step by step as we created this fun little article! No Birthday should be celebrated without cake…and a 1st Birthday deserves two cakes: a main cake for serving your guests and a SMASH cake for the 1 year old to, well…smash! 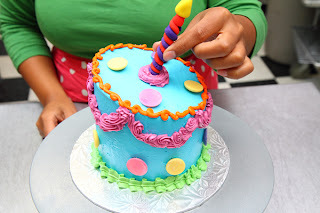 If you’re up to the challenge (trust us, it’s more fun than a challenge) of making a cake for your little celebrant, just follow these easy steps and the results will be sweet. Tools for decorating: cake board for displaying your cake, gel food colouring, small angled spatula for icing, serrated bread knife for cutting your cake, couple of icing bags, icing tips# 5, 18 & 67, lollipop stick, some coloured fondant or fruit rollups, coloured chocolate wafers (smarties or skittles are fun too), turn table (not pictured). You can use 2 to 3 colours of pre-made or home-made fondant, fruit rollups or thin liquorice, etc. Step 1. 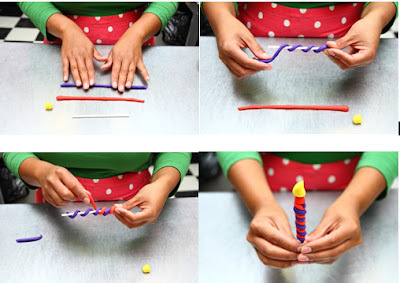 Snake out 2 colours of fondant double the length of your lollipop stick. Step 2. Wrap one piece around the stick, and then intertwine the second piece. Pinch the ends together so they stick. Step 3. For the “flame”, form a tear drop shape with a smaller piece of fondant and stick on the top of the lollipop stick. 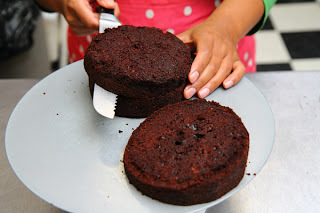 A smash cake is simply filled and covered with your favourite frosting or buttercream, so you can use any kind of cake you want, but from scratch is always best. For a taller cake, bake your cake in a 3” tall pan. You will need to cut your cake two times: one simply straight across, and another layer at a sharp angle if you want a wonky shaped cake. Once all the layers are sliced, be sure to flip the top layer over to get a crooked effect. Place a dollop of buttercream on your cake board to secure the first layer of cake. Fill a piping bag with your choice of buttercream, frosting, pudding, custard, etc. and fill each layer of cake. Once all your layers are filled, ice a thin layer of buttercream to mask your cake. This will seal in any crumbs and give you a smoother surface. Place the cake in the fridge and let it set for about 15 minutes. Once the mask coat is set, you can start adding more buttercream or frosting to the top and sides of your cake until your icing is smooth and you feel there is enough icing. 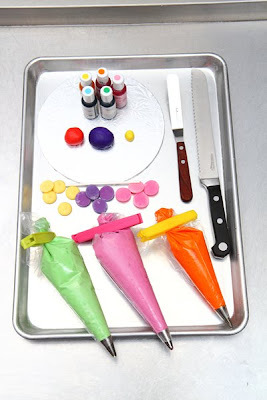 Fill 3 piping bags with different colours of icing. Using tip#18 (star tip), pipe swags around the cake making an “e” motion” with your wrist as you pipe the buttercream. Use tip #67 (leaf tip) for the base border and pipe a ruffle around the base in a back and forth motion. With tip #5 (round tip) pipe a squiggly top border making an “s” motion as you squeeze the icing out. Finally, add your candies (we used merkens coloured wafers) and the candle you made earlier…be sure to place it in at a slant for an extra Whimsical effect! We can't wait to share more fun and BIGGER projects with you in the near future.